Philadelphia Roast Pork Sandwich – An Icon! Italian-style roast pork sandwiches are a Philadelphia tradition. If you are not from Philadelphia, put this sandwich on your list of must-tries when visiting. One of the best ways to enjoy this sandwich when making it at home is with a good-quality, aged, sharp provolone cheese and topped with broccoli rabe (also referred to as rapini). And, of course, you must have good bread. After all, the sandwich cannot be good if the bread is just mediocre. If you don’t have access to good artisan bread, I’ve found french baguettes from Panera Bread to be a very good standby. Getting back to this sandwich…this will always remind me of my father. He loved these sandwiches so much and proudly made them fairly often. He would always use pork shoulder, claiming that it was more flavorful and juicy than other cuts of pork. My dad would debone the pork himself, lay it flat, and then spread generous amounts of crushed garlic, crushed dried bay leaf, salt, pepper, and parsley over the meat. He would then roll the meat up tightly, secure it with butcher’s twine, and let the roast sit in the refrigerator for a few hours to allow for the flavors to penetrate the meat before cooking it. You may even refrigerate overnight, but you would have to omit the salt and add it to the exterior just before cooking or you risk drawing out all of the juices, leaving you with a dry cut of meat. The aroma coming from the oven is heavenly as you cook this roast. For the sandwich you see here, I cooked the meat a bit longer than he used to because I wanted to shred it rather than slice it. However, the more traditional method of preparing this dish would be to cook it in anticipation of slicing it very thinly and I plan to do this next time I make this dish. Be careful here – overcooking pork is a common problem and it pretty much ruins the meal. One of the highlights of this sandwich is stuffing it with juicy and tender meat. Read more about cooking pork here. If you aren’t a fan of broccoli rabe, or can’t find it in your local market, you can always skip it or substitute roasted red peppers, hot peppers, or spinach as a topping. Thanks to Smitten Kitchen for providing information on salt, which is an important part of this recipe. Spread oil mixture evenly on top of pork, and then roll up, jelly-roll style and secure with butcher or kitchen twice, place in a baking dish, and cover with aluminum foil. You may let the roast sit in the refrigerator overnight if you choose to, but omit the salt from the mixture above and then rub it all over the outside of the roast just before cooking so the roast. Before cooking, allow the roast to come to room temperature for about 45 minutes if you refrigerated it. Immediately transfer the roast to a roasting pan, fat side up, set atop roasting grate and add carrots, celery, and onions to the pan. Roast uncovered for about 2 to 3 hours, until an internal thermometer reads 145 degrees. Alternatively, the meat can be cooked in the slow cooker until it reaches the shredding point, which will vary my model. Warning; do not overcook the pork! It is the most common problem when cooking pork. After the meat is cooked, allow it to cool and then slice very thinly. While the meat is cooking, prepare the broccoli rabe. Rinse the broccoli rabe thoroughly and break or cut about 1/2 inch from the ends, which can be very tough. In the meantime, prepare an ice bath in a large bowl with water and plenty of ice, and have a large slotted spoon available. When the water is boiling, submerge the broccoli rabe and cook for about 1.5 to 2 minutes, until just tender. Immediately transfer the greens to the ice bath to stop the cooking process. In a medium-sized frying pan, saute red pepper flakes, minced shallot, and 1 clove of minced garlic until fragrant. 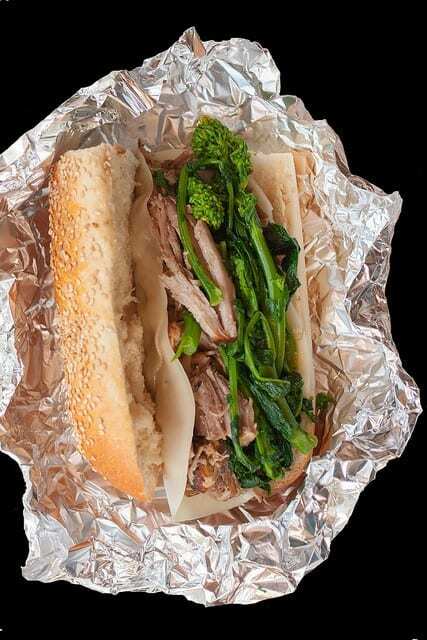 Add the cooked broccoli rabe, toss only until flavored, and set aside until you are ready to assemble the sandwiches. After the pork has been cooked and sliced, strain the pan drippings and set the drippings aside. Heat gently for 15 to 20 minutes. Add the strained pan drippings. 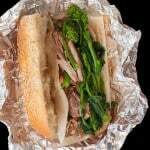 Layer with provolone cheese (on bottom), followed by a pile of hot sliced or shredded pork in the au jus, and top with the broccoli rabe. This is an exampile of regional cooking…these sandwiches are common here in Philadelphia but not so much in other parts of the country..
Hi Deanna! Nice to meet a fellow Philly blogger:) I’ve yet to try DiNic’s..can you believe it? I guess it’s because we usually make this at home and always have…I’m gonna try one soon though. I hear so much about them. And, yes, I agree and much prefer these to cheesesteaks.